Photo by Gilbert Carrasquillo/FilmMagicLast week, Alicia Keys held the 10th Annual Keep a Child Alive Black Ball at the Hammerstein Ballroom in New York City. 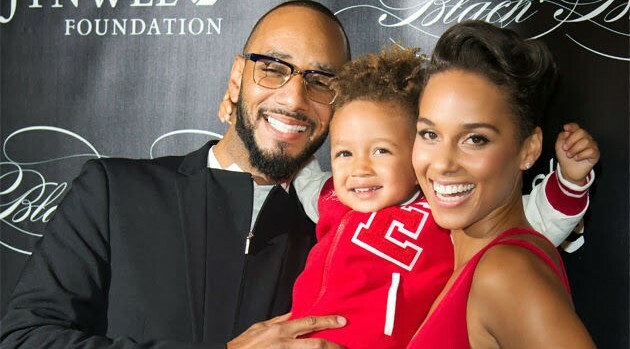 However, before she performed alongside Pharrell Wiliams, she and her husband, Swizz Beatz, paused to tell reporters about how much the couple is enjoying raising their 3-year-old son, Egypt Daoud Dean. With the holiday season quickly approaching, Swizz chimed in that Christmas shopping should be easy since there isn’t any toy in particular that Egypt is hoping for this year. When asked what’s been the biggest highlight for the producer, who contributed to Jay Z‘s Magna Carta… Holy Grail, Swizz explained to ABC News Radio why his family takes the cake. “Man, I don’t know, just waking up to my family. Just waking up everyday and being able to do the things that God is letting us do, I’ll say that’s the highlight,” Swizz replied. In addition to having a great kid, Alicia considers her husband to be a blessing. “He’s like the most romantic person in the world, like, he’s just very unique and he’s very thoughtful and he always introduces me to new things, which I think is the thing that makes us really compatible together,” she explained. The pair have been together since fall 2008.